This page discusses our product, Two Way Resume. 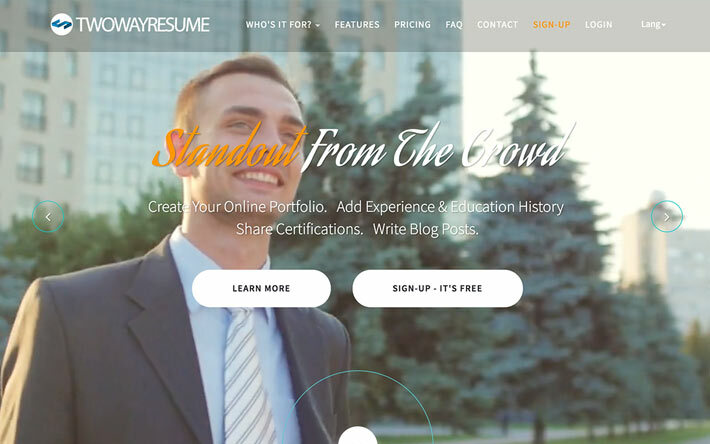 The personal resume & portfolio website builder. Learn more below. Introducing Two Way Resume. The Personal Website Builder. Over 80% of first impressions are now made online. You can bet that most recruiters are 'Googling' a person prior to bringing them in for an interview. What is your online reputation (or lack of one) saying about you? A personal website is the #1 most impressive tool an applicant can have based on a recent study by a leading recruiting firm. Rather than recruiters finding your social media accounts or unintended results, take control of your online reputation with a personal website. Interested in signing up for Two Way Resume? Sign-up for free! You can get started instantly and begin building your online reputation.